Inauspicious stars overshadow auspicious stars in your path this year, and your luck will be better if you stay calm. Business progress is slow. The idea of share split occurs among shareholders. Financial turnover might be hindered. Improper use of men might lead to lawsuit. Do not attempt to develop overseas business, or invest in short-term stocks. Do not trust your friends easily to avoid suffering losses. Colleagues often quarrel with each other due to intolerance and differences in opinion. Your mood swings and you are inefficient in carrying out your duties. Your superior might be picky and you might feel pressured. Avoid making hasty decisions such as resigning from your current job. If you are posted overseas, the personnel relationship you face might be more complicated. Those born in the 1st, 2nd or 6th lunar month have chances of windfalls, but you should not be insatiable. It is a good time to invest in long-term stocks. Those born in the 4th, 7th or 10th lunar month might not be as lucky, and should refrain from gambling and investment. Love blossoms for those born in 1995, but you should always be mindful or your romance might go out of control. Those whose relationship is matured should consider marriage. Married couples born in 1983 should consider having a child. Those who have just entered a new relationship must not be too obsessed or paranoid, to avoid unnecessary suffering. Spouses tend to get into arguments on trivial matters. Those born in 1959 might have to worry for their children. Weak elderly might be troubled with health conditions. There will be incidents in the neighborhood due to minor problems. 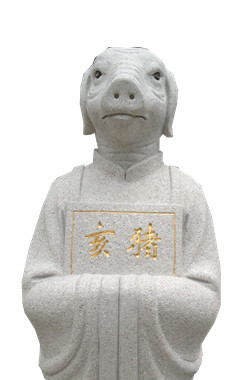 Anyone born in the year of Pig should pray to Taisui, light a lamp for blessing, and engage in more charitable deeds. Do bring home an auspicious ornament for good fortune.